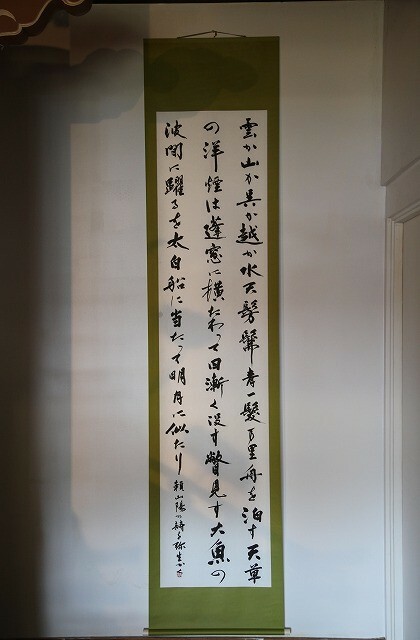 This huge piece of caligraphy was dedicated by Miss Yayoi and it is now displayed here at Koloa Jodo Mission. I'd like to thank Miss Yayoi and Tsuruwaka family who kindly donated this artwork to Koloa Jodo Mission. 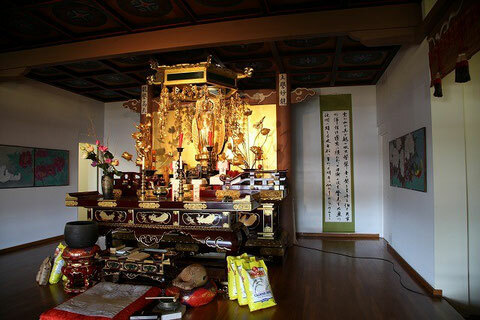 The family is a member of my home temple in Japan and I requested her to write something for Koloa Jodo Mission when I visited her family altar last year. What's written on this work is a short poem by Raisanyo (1781-1832) who was a very influential thinker and noted hisotrian during the late Edo Period. The title of this poem is " Amakusa-Nada ni Hakusu" which described beautiful scenery of Nagaski toward China.